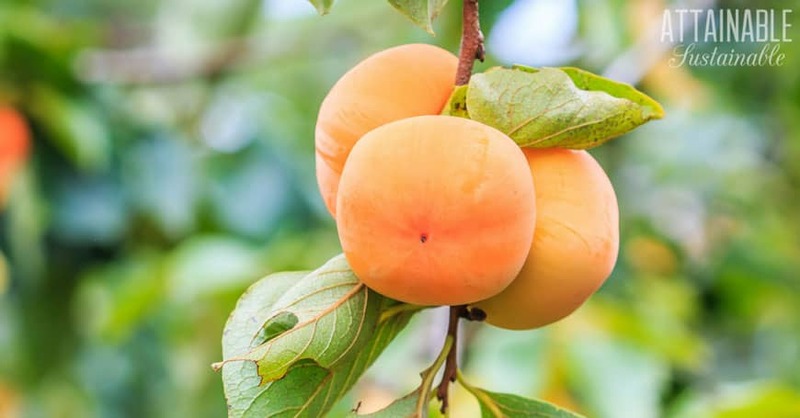 If you’re trying to plant and harvest crops year round, adding a persimmon tree to your garden or small orchard is a great option to fill in the winter months. Here’s what you need to know about persimmon varieties. Not all persimmons are created equal! When I was growing up, my grandpa couldn’t wait for persimmon season. When the leaves of his persimmon tree began to turn color and drop, the anticipation grew. Eventually, the tree was bare of leaves, leaving behind a lovely skeleton of a tree adorned with orange fruit. 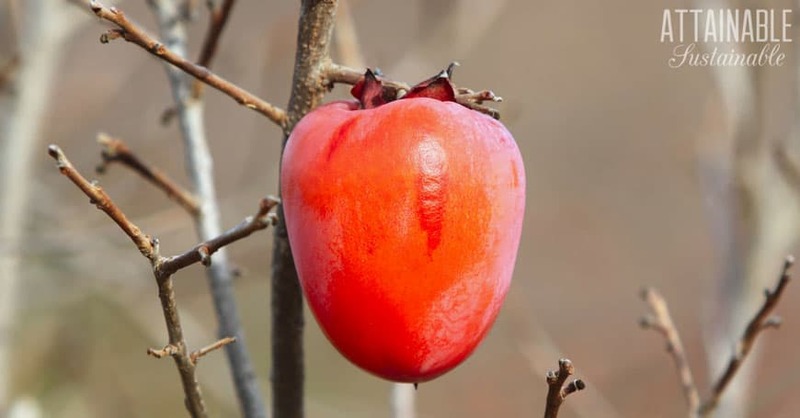 That fruit would hang for months on his persimmon tree, it seemed, and he’d happily harvest them one at a time to eat. The tree was beautiful in the fall, but the fresh fruit? Blech. If it was underripe, it was terribly astringent. Ripe, it was soft like a pudding, a texture that I just couldn’t handle. The soft fruit was excellent for baking with, though, and persimmon cookies were annual fall fare. Turns out, there are different types of persimmons and I didn’t give them enough of a chance. Grandpa’s tree was an American persimmon variety, known for its soft fruit. Years later, someone finally convinced me to give fresh persimmons another chance, promising that a Fuyu persimmon was different. And they were. Fruit from a fuyu persimmon tree is quite different. Fuyu persimmons are still crunchy when ripe, and they have a flavor that’s a bit spicy and apricot-like. These? I like. They’re tasty out of hand or made into a salad. 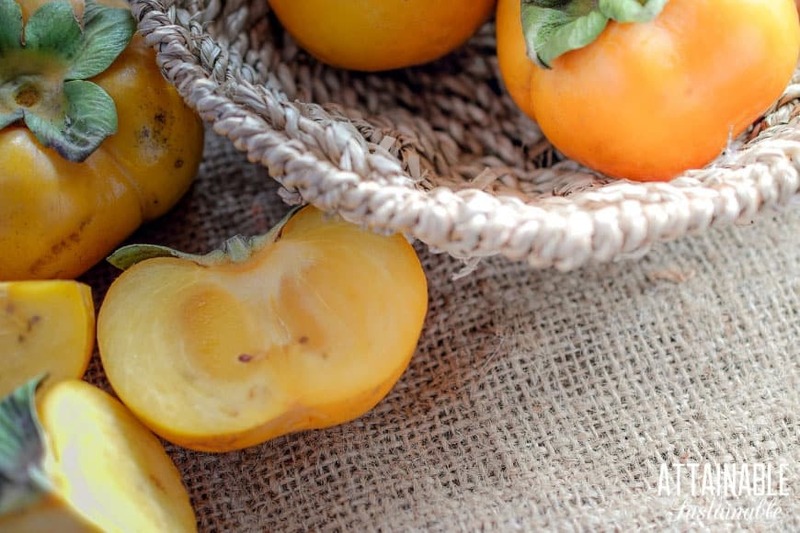 There are a number of persimmon varieties to choose from, each with its own merits and uses. 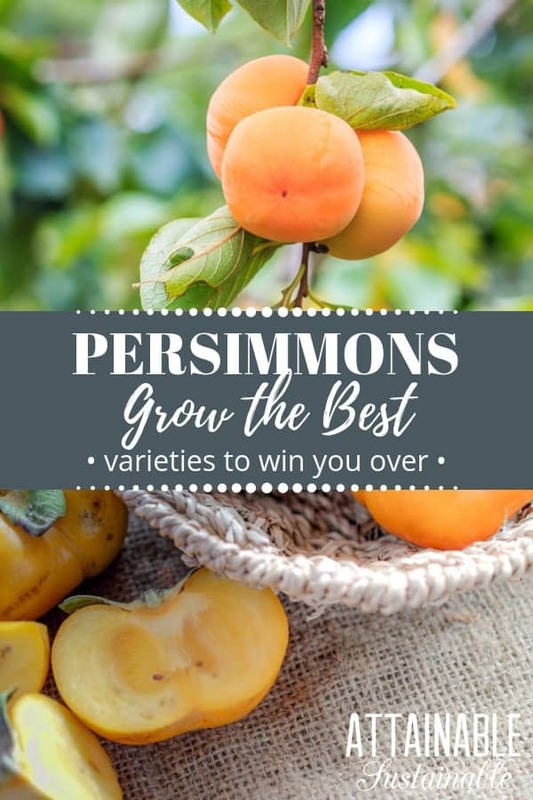 Which persimmon tree you opt to plant will depend on a number of factors: What grows well in your region, how you plan to use the persimmons, and the space available to you. Thousands of persimmon cultivars exist, but a few are commonly planted. Of these, there are those that bear astringent fruit and those that bear non-astringent persimmons. The astringent fruits must be very, very soft before they are ripe enough to eat. Get impatient and you’ll find yourself trying to figure out just what happened. The tannins in an unripe persimmon cause a puckery dry mouth that is unpleasant. Not surprisingly, the American persimmon (Diospyros virginiana) is native to North America. It’s cold-hardier than its Asian counterparts, and larger as well. An American persimmon tree reaches 35′-50 feet in height and width. Two common named varieties are Prok and Yates. This is a self-pollinating persimmon variety, so a single tree will produce fruit. The fruit of an American persimmon tree is astringent and must be quite soft before it’s considered ripe. Use the flesh in baking or to pull together a batch of my persimmon granola or persimmon pancakes. Bearing non-astringent persimmon fruit, this is — in my opinion — the best persimmon. A Fuyu persimmon tree will grow 15′-20′ tall and equally as wide. It’s self-pollinating, so a single tree will produce fruit. The fruit of a Fuyu persimmon tree stays firm when ripe. It’s crunchy like an apple and great for slicing onto a plate for snacking or adding to fresh salads. A Hachiya persimmon tree will grow 15′-20′ tall, and like the Fuyu, is self-pollinating. The acorn-shaped fruit of a Hachiya persimmon tree is another astringent one. Pull off the calyx and use a spoon to scoop out the pudding-like, almost translucent fruit of this persimmon variety. Or use it to make a batch of our favorite persimmon cookies. 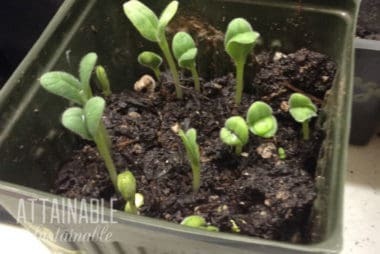 Plant persimmon trees in full sun. Most persimmon varieties prefer well-drained and slightly acidic, fertile soil. 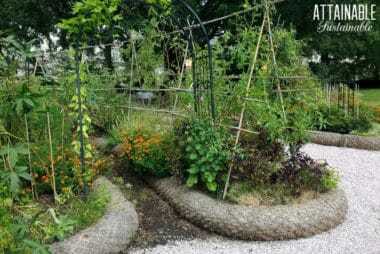 Add a layer of mulch around the planting area, but don’t fertilize young trees. Even older trees only require fertilization if growth stalls or leaves lose their dark green color. 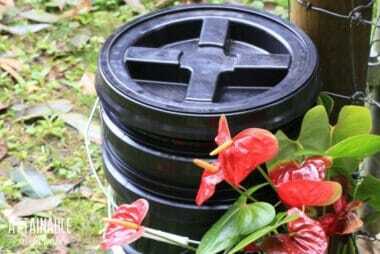 Use a balanced fertilizer or spread a layer of compost around the base of the tree. Be mindful that too much fertilizer can cause fruit to drop prematurely.